​Free for CO3 Members, drop-ins welcomed! Bring your lunch and stop by the HUB for a fun, engaging discussion from noon till 1pm weekly. A great reason to get out and gather with some awesome people around the table together, 'break bread’, catch up, talk about our wins of the week so far and share in interesting conversation over lunch. ​643 Main Street Mahone Bay. ​Free for Members, drop-ins welcomed! Coffee Club is a place for freelancers, entrepreneurs, founders, developers, designers, digital nomads, remote workers, and anyone else that works independently to meet informally, get connected, and grow the community of 'entrepreneurial people doing entrepreneurial things' here on the South Shore. 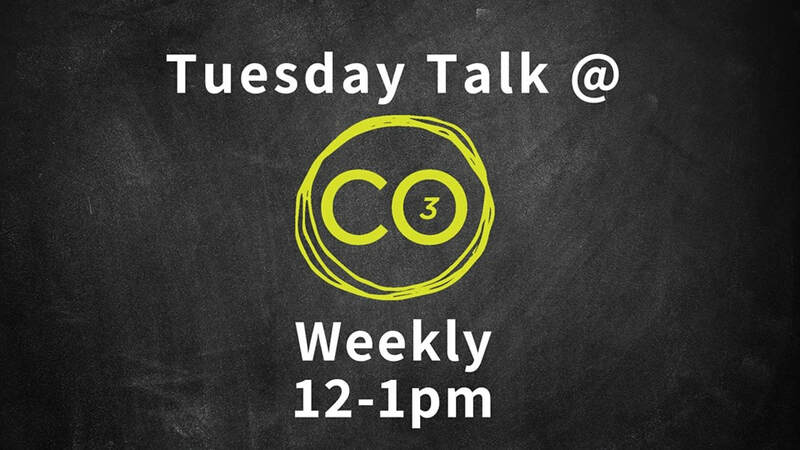 We meet at CO3 (www.co3space.com) the first Tuesday of every month, drop by any time between 8:30AM and 9:30AM. There will be free coffee and tea here for you to enjoy, but feel free to bring you're own morning beverage of choice! A bi-weekly lunch chat happen on the 2nd & 4th Thursday of the month. The discussions are focused around a VERY wide variety of topics of interest to small business owners, freelancers, entrepreneurs and remote workers. Bring your lunch and join us around the table, you never know what conversations can arise and who you might meet! We alternate hosting these at CO3 and the HUB. Free for Members, drop-ins welcomed!